Many blessings to all of you for Candlemas today. Today, for Imbolc/ Candlemas, we made our own hand dipped beeswax candles. Local beeswax, sunny day and willing children makes for a good afternoon. I really want to try to make our own beeswax candles some day. It looks like such a great activity. 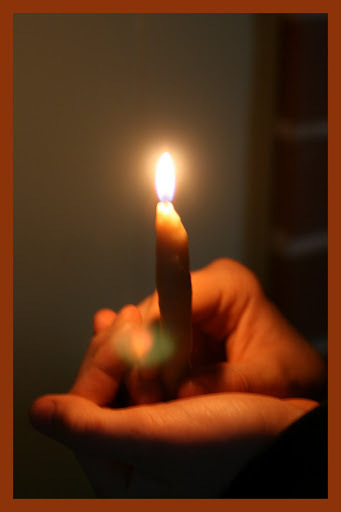 This is a very nice project - and your picture of the lit candle is just beautiful! We really enjoyed dipping candles in the Fall, and now we are enjoying using them! We enjoyed our Candlemas, too. Happy day! Lucky you! They look so nice. hmmm i have a lot of bees wax left over from making lip balm and lotion bars. i might need to do this this weekend if i end up being snowed in :) thanks for the idea! You are celebrating pagan traditions and holidays. I never followed that you may be....I look forward to getting into our home and following them too with my children. Beth, Candlemas is a catholic holiday; Imbolc is a Pagan holiday of sorts (in being that it is older than Catholicism). And St Brigit is also religious. They are all on the same day, along with groundhogs day. We follow Anthropological festivals and anything else that catches our fancy. We are not pagan, or Christian... we just honor the festivals that people have celebrated through the centuries. Whatever they come from. Yes, Candlemas is catholic. Joe is catholic. I recognized Imbolc as being pagan from my readings. Interesting that you follow so many traditions from so many religions. Does that get confusing (for the kiddo's) or do you not focus on the religion side of it? We don't focus on the religion side of it at all. We are painting the seven days of creation in our homeschooling right now (they are actually really pretty if you pop over the homeschool blog) and it has nothing at all to do with religion. I treat it as I would treat Greek mythology, or Roman mythology. It is a great story... and a great story that diserves to be told. If they take something spiritual from it, then that is theirs. In a way, with my messed up religious background, I am healing a wound with these studies and celebrations. We were very religious growing up, but we went through everything you could imagine... we were Four Square, Luthern, (it's late... I don't know if my spelling is messed up), Baptist and more (at one point I was in a Seventh Day Adventist school and a Sunday Lutheran and was told regularly that I was going to hell for it). By the end I knew only of what I DIDN'T WANT to be. It is next to imposible to see the gentle side of religion through that. The side that could be awesome stories and morals told with thought, love, and intention. By the end of that, I was just another 'recovering christian'. The kind that had a bumper sticker that said "Please God, save me from your followers." At this point I see hope in religion. Christianity in particular. But no devotion. It may be a path we take in the future, but for now, we are just enjoying the sweet stories from all kinds of faiths. My kids won't be messed up like I was.